Thanks to rubberskunk, Bizarre stuff you can make in your kitchen, here, looking at slime. "Quicksand, many pastes and glues, gelatin, and ketchup are all non-Newtonian fluids. There are two main types of non-Newtonian fluids, rheopectic and thixotropic. The slimes, oozes, globs etc. on this page are rheopectic, which means they show an increase in apparent viscosity (resistence to flow) with time under a constantly applied stress (they do not have a well defined viscocity)." tursi might like to hear that Father of the Pride is coming to R1 DVD, on June 7th. 14 episodes, plus the pilot, with commentaries, and scripts of episodes unmade, at a list price of $30. There are ten tracks from Paranoia Agent available from the composer's site - apparently, they're ones which didn't appear on the soundtrack CD. ("Big Brother" and the others aren't from that series, but worth checking out anyway. BB's going to appeal to those who enjoy videogame bleep music :) And on that note, here's where this entry's soundtrack came from; sample-based breakbeat with a sense of humor. Honesty in spam - one just arrived with the subject "Inquiry #5256 about filters", appropriately from "crap HQ". The only note I'll add to the Schiavo case: an entry on Respectful of Otters, looking over the specific facts of the case, and the affidavits offered, from a medical perspective. 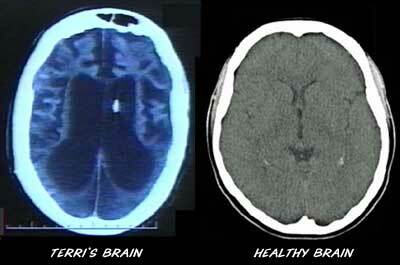 Alas (a blog) offers a comparison of CAT scans; the dark area is where the now absent cerebral cortex has been replaced by spinal fluid. And I couldn't help but pass on kurtmrufa's find of an absolutely fascinating article on the nature of earwax and smegma. Amongst other things, it notes an experiment in which mice were treated by rubbing or injection of smegma onto or under their skin: "There was no significant difference in the survival rates of treated and control mice up to the 400th day of life: 85 and 88 per cent, respectively, after 200 days; [...] From the 600th day on, there was a marked difference (26 and 6 percent, respectively), and on the 700th day, the survival rates were 12 and 1.5 per cent." Well, according to an excerpt of a Discover magazine article (which appears to be unavailable) mentioned in a Kuro5hin article, a pilot molecule cracker which can efficiently convert organics of a wide variety into various grades of oil: "If a 175-pound man fell into one end, he would come out the other end as 38 pounds of oil, 7 pounds of gas, and 7 pounds of minerals, as well as 123 pounds of sterilized water." Now, not being a horse sort at all, I'll take a mostly-blind guess based on the charts here.. let's say we're talking of a Generic Horse being around 500lb. That'd mean triple the above figures - I'd guess the ratios are fairly linearly scalable within this sort of size range, or around 120lb of oil, or 50kg. This materials safety sheet indicates the density of Diesel Fuel No.2 as being around 0.87 - 0.95 g/cm³, so let's say 0.9kg/l - so that 50kg of oil is around 55 liters. As a rough guide to current diesel car fuel efficiency, this article notes the consumption of a "current production Toyota Avensis using a 2.0-liter diesel with D-CAT" as 5.8 liters per 100 km, so, you'd actually be able to go around 600 miles on one horse. But only once. Perhaps is the future one can leave ones body to Esso! Thanks for posting the Schiavo links; I was fairly sure where I stood on the issue before from an ethical standpoint, but I was unaware of the medical aspects of the case. It's actually a story I'd managed not to hear too much about, but, I admit, when coverage entered saturation mode, I felt I ought to find out some of the basis for the whole tragic affair. *sigh* It does seem fairly blatantly clear that the person she was is gone - Elvis has long since left the building. What's left is, effectively, a simulacrum. Bad enough for all concerned, let alone that it should have been turned into such a three-ring circus, with death threats (ah, sweet irony - coupled with Bush's Texas law permitting forcible support termination if the money runs out) being lobbed around too. Excellent writer! I've befriended respect_otters.